Multi-talented Rise Entertainment World hip-hop artist GeneBuck is more than a rapper. The Sin City (Las Vegas) artist is one of the most prolific composers of street poetry anywhere in the country, and his R&B-flavored jams take a backseat to no other up-and-coming act. According to Billboard magazine, blogs, and other credible sources, hip-hop/R&B is presently the biggest genre of music on earth, and if GeneBuck has anything to say about it, it will remain that way for generations to come. After you listen to the rapper’s musical creations for the first time, it will be clear that he has something special, a uniqueness that transcends culture, age, and geography. His part Latin musical background meshes with well-known indigenous musical art-forms, and his latest single “Like You Before” is a direct indicator of that. GeneBuck believes ‘this track is full of sweet accolades aimed at the heart of those who long to have it the way it ought to be in today’s love game. In a recent conversation with an industry insider, the quick-thinking wordsmith leaves nothing to the imagination, to guesswork, no needless shucking and jiving, but he always keeps it real. Remember, too, his street cred, unlike many, is the source of non-fiction, and his convictions are rooted in more than the street life; it is life — period. He is also an avid student of the rap game, continually absorbing and thirsting for more ideas and new beats, and he has the knowledge and battle scars to prove it. In the second track on his upcoming album “Hennessy and Lemonade,” like many other tunes in his musical potpourri, you hear an intoxicating rhythmic novella oozing generic street beats. What is also noteworthy in the life of GeneBuck is the time he spends listening to the songs of contemporaries and others who have influenced his productions and paved the way for his arrival on the slippery music scene. From Lil’ Wayne to the Isley Brothers (Motown greats) and countless other prior music trendsetters, GeneBuck will make music one way – the right way. He is a formidable stage performer, easily exciting the audience to beg for more as he dishes up heaping servings of well-done hip-hop, which he performs at premier clubs such as The D Las Vegas. Included in his plans for 2019 are concert tours and special appearances, which include television and international radio interviews. He is also looking forward to appearing in film and television, demonstrating to the world he is not one-dimensional but a truly versatile international performer. Multi-talented hip-hop artist GeneBuck is more than a singer/rapper. The Sin City (Las Vegas) resident is one of the most prolific composers of street poetry anywhere in the country, and his R&B-flavored jams take a backseat to no other up-and-coming act. According to Billboard magazine, blogs, and other credible sources, hip-hop/R&B is presently the biggest genre of music on earth, and if GeneBuck has anything to say about it, it will remain that way for generations to come. After you listen to the rapper’s musical creations for the first time, it will be clear that he has something special, a uniqueness that transcends culture, age, and geography. His part Latin musical background meshes with well-known indigenous musical art-forms, and his latest single “Like You Before” is a direct indicator of that. His debut television appearance was received well as he performed his hit to a live audience, receiving a rousing reception from the NBC-Ch.3 station in Las Vegas. This first TV appearance came a week after his video release. GeneBuck believes ‘this track is full of sweet accolades aimed at the heart of those who long to have it the way it ought to be in today’s love game. In a recent conversation with an industry insider, the quick-thinking wordsmith leaves nothing to the imagination, to guesswork, no needless shucking and jiving, but he always keeps it real. Remember, too, his street cred, unlike many, is the source of non-fiction, and his convictions are rooted in more than the street life; it is life — period. He is also an avid student of the rap game, continually absorbing and thirsting for more ideas and new beats, and he has the knowledge and battle scars to prove it. In the second track on his upcoming album “Hennessy and Lemonade,” like many other tunes in his musical potpourri, you hear an intoxicating rhythmic novella oozing generic street beats. What is also noteworthy in the life of GeneBuck is the time he spends listening to the songs of contemporaries and others who have influenced his productions and paved the way for his arrival on the slippery music scene. Like Lil’ Wayne to the Isley Brothers (Motown greats) and countless other prior music trendsetters, GeneBuck will make music one way – the right way. He is a formidable stage performer, easily exciting the audience to beg for more as he dishes up heaping servings of well-done hip-hop, which he performs at premier clubs such as The D Las Vegas. Included in his plans for 2019 are concert tours and special appearances, which include television and international radio performances and interviews. He is also looking forward to appearing in film and television, demonstrating to the world he is not one-dimensional but a truly versatile international performer. Since he was a teenager, Gene’s focus was on hip-hop and the music to which it is inseparably linked, R&B. Stay tuned for more fine music from his growing discography. 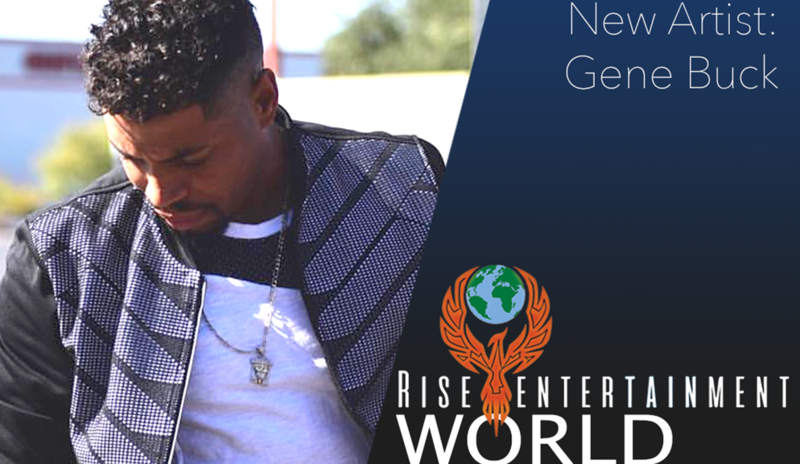 Multi-talented Rise Entertainment World hip-hop artist GeneBuck is more than a singer/rapper. The Sin City (Las Vegas) artist is one of the most prolific composers of street poetry anywhere in the country, and his R&B-flavored jams take a backseat to no other up-and-coming act. According to Billboard magazine, blogs, and other credible sources, hip-hop/R&B is presently the biggest genre of music on earth, and if GeneBuck has anything to say about it, it will remain that way for generations to come. After you listen to the rapper’s musical creations for the first time, it will be clear that he has something special, a uniqueness that transcends culture, age, and geography. His part Latin musical background meshes with well-known indigenous musical art-forms, and his latest single “Like You Before” is a direct indicator of that. GeneBuck believes ‘this track is full of sweet accolades aimed at the heart of those who long to have it the way it ought to be in today’s love game. In a recent conversation with an industry insider, the quick-thinking wordsmith leaves nothing to the imagination, to guesswork, no needless shucking and jiving, but he always keeps it real. Remember, too, his street cred, unlike many, is the source of non-fiction, and his convictions are rooted in more than the street life; it is life — period. He is also an avid student of the rap game, continually absorbing and thirsting for more ideas and new beats, and he has the knowledge and battle scars to prove it. In the second track on his upcoming album “Hennessy and Lemonade,” like many other tunes in his musical potpourri, you hear an intoxicating rhythmic novella oozing generic street beats. What is also noteworthy in the life of GeneBuck is the time he spends listening to the songs of contemporaries and others who have influenced his productions and paved the way for his arrival on the slippery music scene. From Lil’ Wayne to the Isley Brothers (Motown greats) and countless other prior music trendsetters, GeneBuck will make music one way – the right way. He is a formidable stage performer, easily exciting the audience to beg for more as he dishes up heaping servings of well-done hip-hop, which he performs at premier clubs such as The D Las Vegas. Included in his plans for 2019 are concert tours and special appearances, which include television and international radio interviews. He is also looking forward to appearing in film and television, demonstrating to the world he is not one-dimensional but a truly versatile international performer.